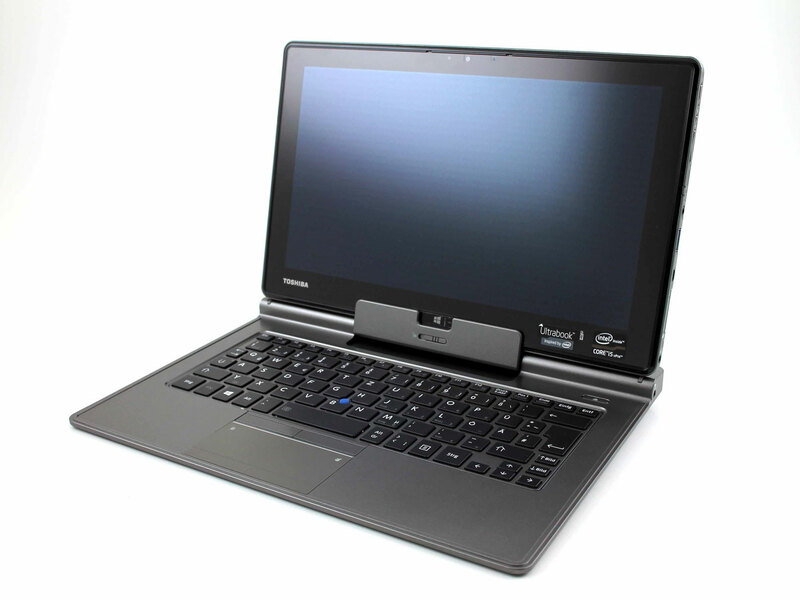 Toshiba Portégé Z10t-A-10M: The multi-purpose device for corporate customers? Toshiba's first Windows tablet that we are testing after the WT310 bears the glorious add-on "Portégé". The manufacturer labels its series for demanding corporate customers with that. The last subnotebook of this kind was the Portégé R930-13F; a 13-inch device with many interfaces, good input devices, and a fairly low weight. The R930 has a docking port on its underside for quickly connecting peripherals. Time progresses and manufacturers believe now is the moment for a new generation. The self-confident businessperson no longer attends meetings with a subnotebook nowadays. Instead, they hold a tablet in their hands. When it comes down to business, the tablet is inserted into a dock with keyboard and nothing stands in the way of productivity. This is exactly the promise Toshiba's Portégé Z10t-A-10M makes. Its price of 1700 Euros (~$2328) is quite steep, but it can replace a subnotebook completely in both performance and connectivity. This connectivity is just what most Windows tablets and convertibles that we have tested could not offer. That is different with the Portégé Z10t. Why it disappointed us in one crucial detail can be discovered in our test report. Lenovo's ThinkPad Helix (tablet + dock) and HP's EliteBook Revolve 810 (classic turn-and-tilt hinge), which both offer the best connectivity and have a very similar price design, are direct contenders on the market. Which device should the productivity-oriented user choose? 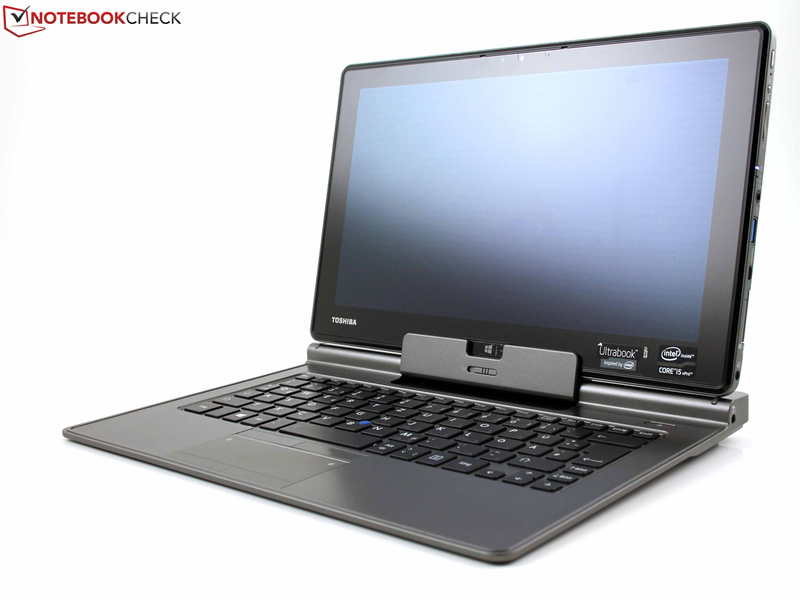 The Portégé Z10t strongly resembles the Toshiba WT310 that we recently tested. In fact, there are only three visible differences. The Portégé has a slot for the SIM card directly over the card reader (LTE modem installed). 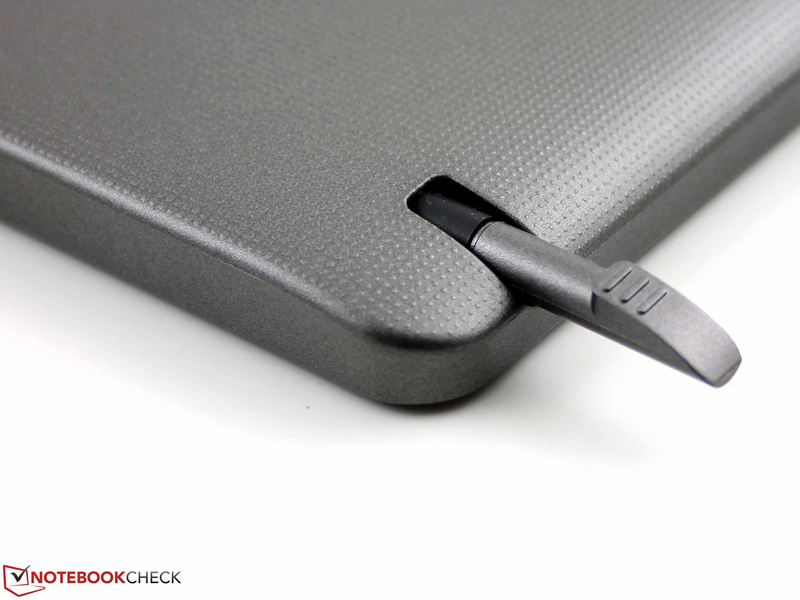 Then, there is a slot for the small stylus on the tablet's upper side. 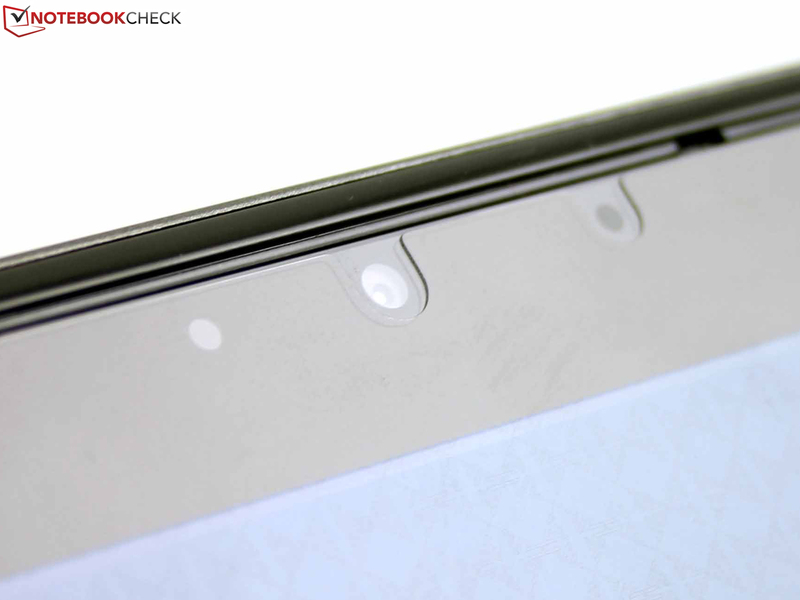 The third difference is the present review sample's anti-reflective screen coating. A professional business Portégé simply should not have a glare touchscreen. 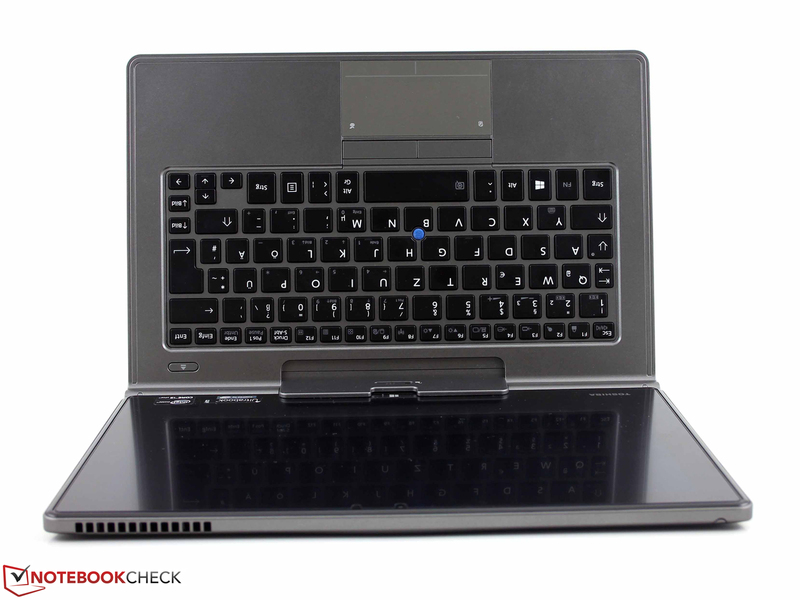 The WT310 is compatible with the Z10t's keyboard dock; we tested that. 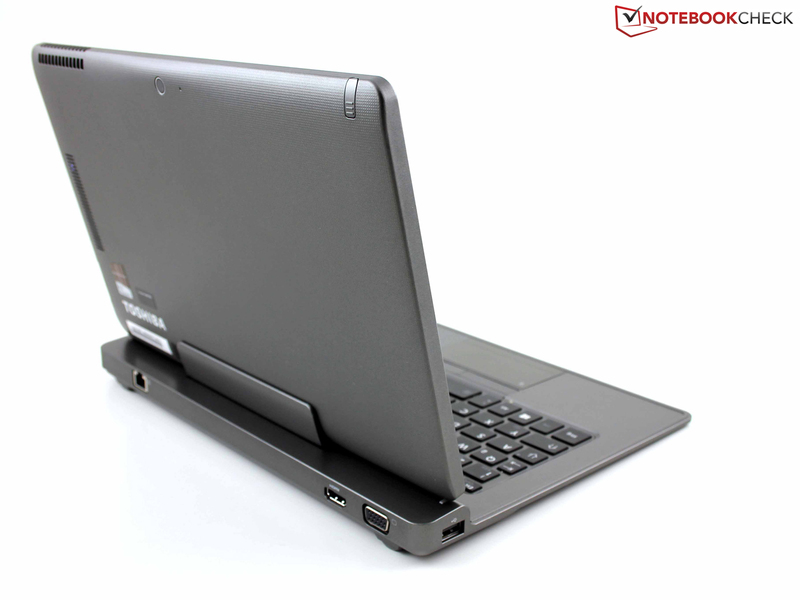 The tablet's chassis consists of a back tray and the installed screen including the components. The dotted plastic has a good feel, but yields to a small extent over its entire area. The screen noticeably moved in its plastic frame when we tried to twist it. The Z10t has this in common with the WT310, and is inappropriate for the 1700 Euros (~$2328) price range. The tablet dock is of higher quality. Although it is thin, its metal base plate reinforces it. Unfortunately, the tablet wobbles in its mount. However, this is not due to the hinge but the plastic fastening. 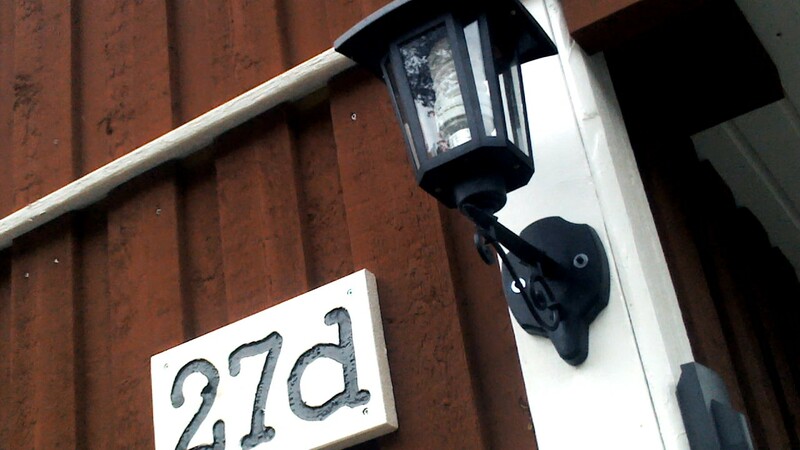 The hinge itself and its hook are metal, and make a long-lasting impression. We believe that the mount will survive frequent, and less careful docking and undocking without damage. All ports are on the tablet's right. They are located relatively low. The dock adds Ethernet RJ45, HDMI, and VGA on the rear, which is very convenient in office use. We would have liked to see another USB 3.0 port on the rear so that universal port replicators could also be connected optionally. However, most users will only need a USB 3.0 hub due to the dock's interfaces. The internal communication equipment highlights the Z10t's professional character. Instead of an Atheros module (W310: AR9485WB-EG 2.4 GHz band), Intel's Centrino Advanced-N 6235 (5 GHz band, dual-stream) works inside. This was last installed in, for example, Toshiba's Portégé Z930-105. It proves helpful when many Wi-Fi connections interfere with each other in one place. However, it does not help the range much. The Z10t lost the router's signal just behind the 15 meter setting (1-2 bars reception). Gigabit Ethernet (Intel 82579LM), Bluetooth 4.0 + LE (Intel, Low Energy maximum 1 rather than 2.1 MBit/s) and a modem for UMTS/HSPA+/LTE reception (Sierra Wireless) complete the bundle. The latter also makes GPS reception possible. Other features work undercover: Execute Disable Bit (XD Bit), BIOS with Computrace support, Intel's Anti-Theft, and TPM (Trusted Platform module). Most security features can be set via Toshiba's Desktop Assist. For example, boot authentication can be set here. 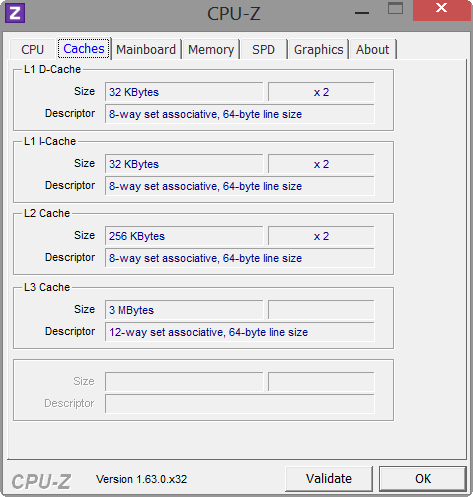 The Settings tool enables detailed settings for devices or the processor (e.g. 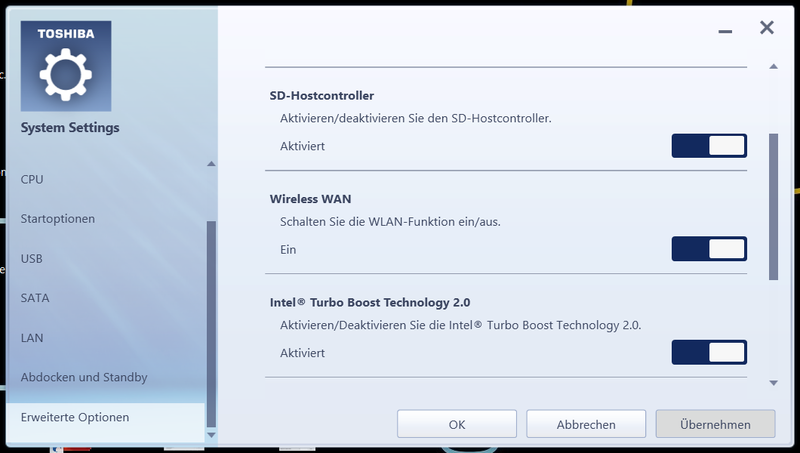 LAN port or disabling Intel's Turbo Boost). In contrast to consumer tablets (Windows), the BIOS is largely configurable. 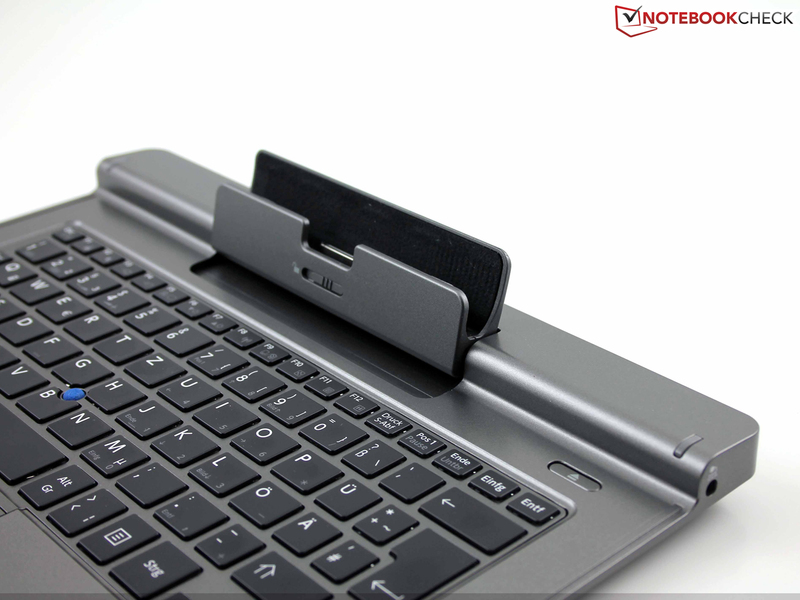 The dock has a spill-resistant keyboard and a button that prepares the system for undocking. It disconnects the keyboard and the peripherals connected to it. A 45 watt power supply, two digitizer pens (small + big), a gray cloth and a spare head for the pointstick on the keyboard fall out of the box. Toshiba's Eco Utility activates a manufacturer-specified preset of energy settings and displays the current power consumption. 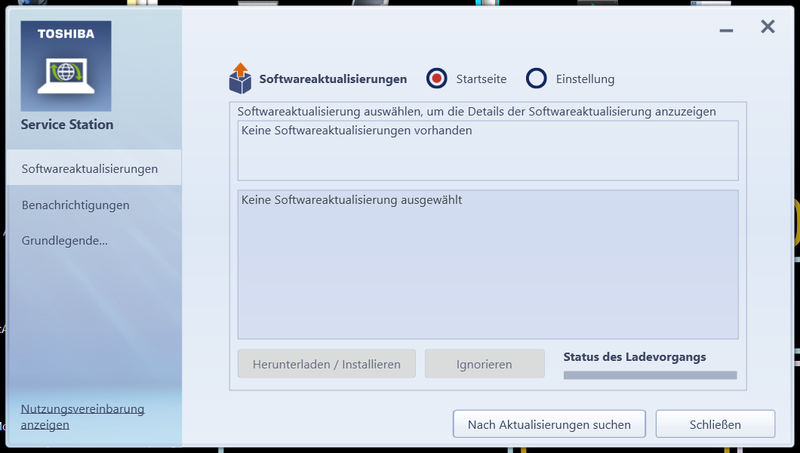 Toshiba's Service Station organizes software updates, whereby data has to be transferred to Toshiba. The PC Diagnostic Tool analyzes the hardware (hardware, drivers, ping test, etc.). The tablet cannot be opened. The two-year warranty includes a pick-up & return service, and a two-year European warranty (without pick-up). 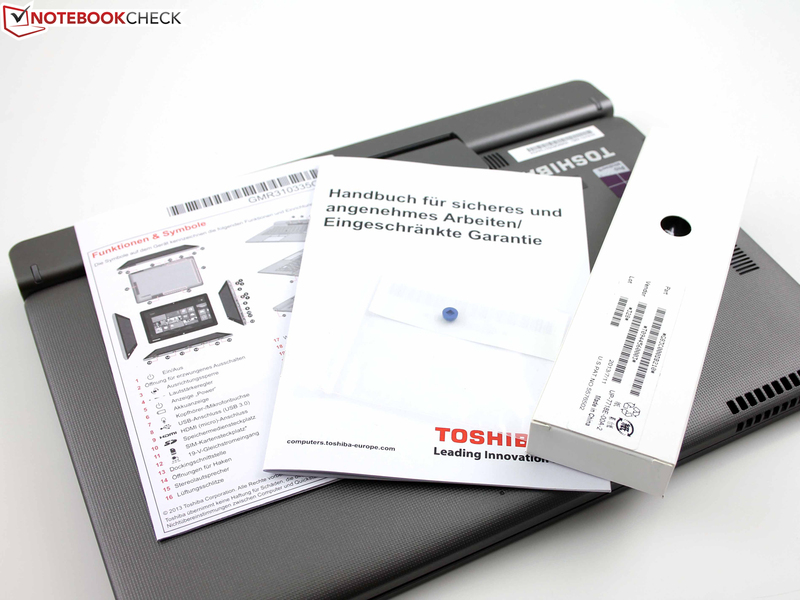 However, the device has to be registered via the TEMPRO tool (warranty, support, service, help). This does not take long because TEMPRO recognizes the model, parts and serial number. Warranty upgrades cost 64 Euros (~$87) for three years and 109 Euros (~$149) for four years. Like the W310, the Z10t has two cameras. 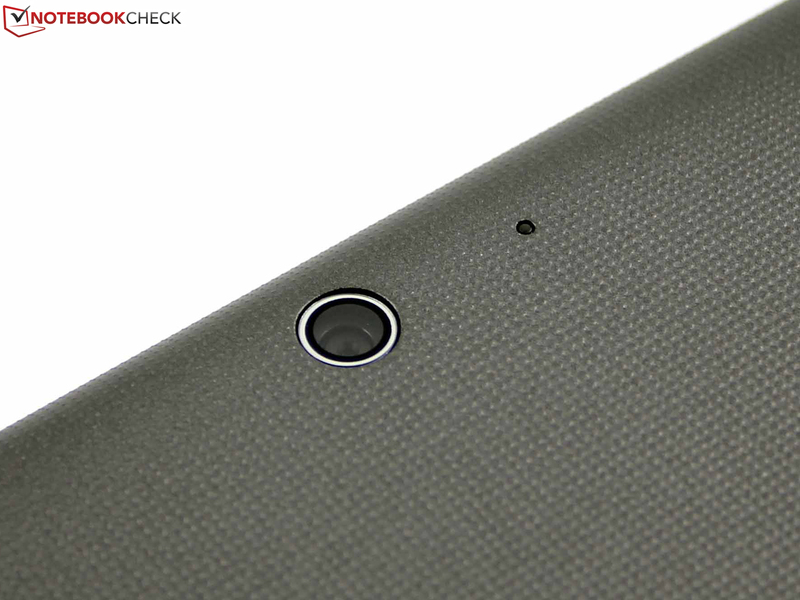 The primary camera on the back is only a 3.0 MP web camera with auto-focus. 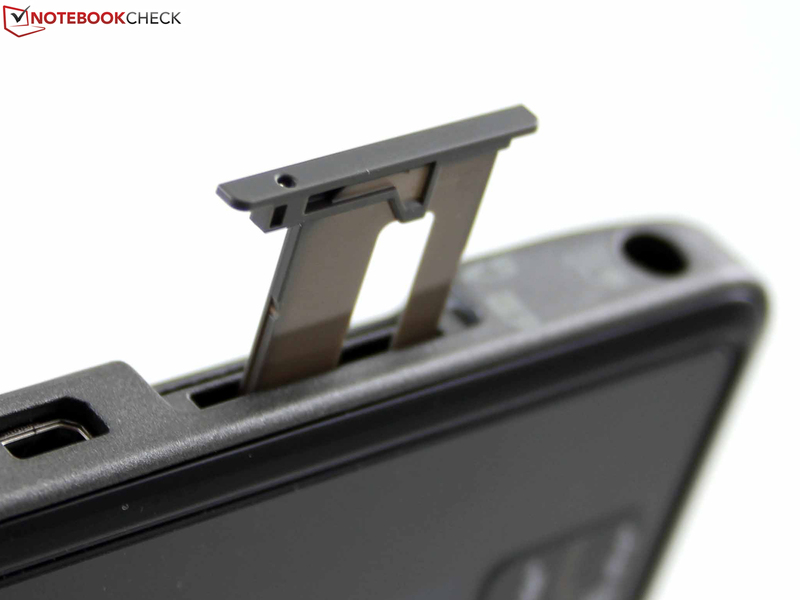 The front-facing unit shoots pictures with 1.0 MP. An ambient light sensor is located beside the front-facing camera. The front-facing camera disappoints with poor focus and blurry photos. The primary camera does a better job. It not only delivers contrast-rich colors, but also good sharpness due to its auto-focus (clear outlines). The 3.0 MP results will nevertheless not satisfy perfectionists because the focus is not set consistently in every picture. Thus, it cannot be called "razor sharp". 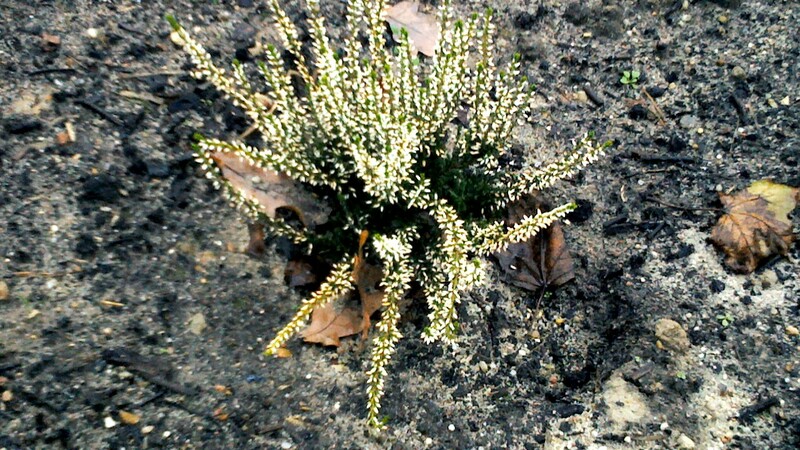 We used a picture shot with a Canon EOS 1100D for reference. The dock's sleek keys have a short drop, soft yet firm stroke (quiet), and a clear but very quickly noticed pressure point. We would describe the keys' feedback as faint. However, typing is nevertheless pleasant due to the sufficiently sized standard layout, the separated arrow keys, and the backlight, although it is not as perfect as on a ThinkPad of the T-series. 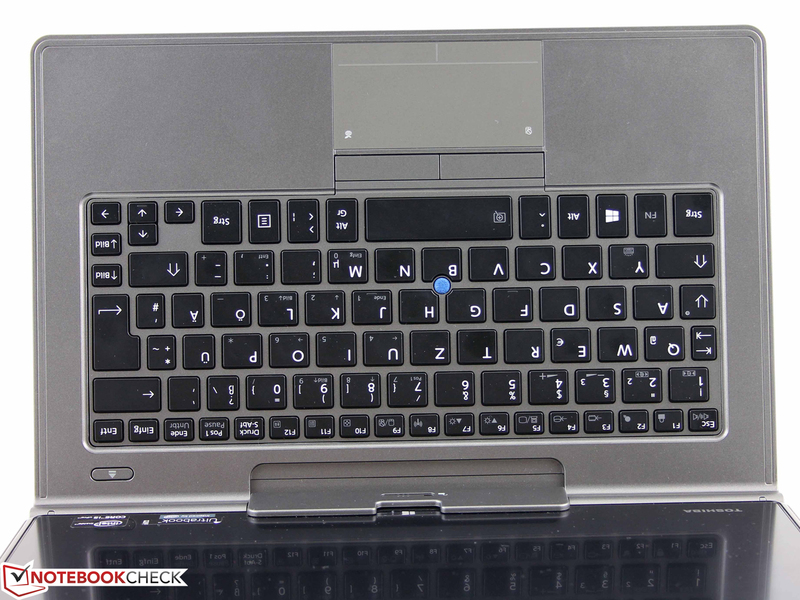 Users who place a lot of value on the keyboard should look closely at the competition in form of Lenovo's ThinkPad Helix 3G and HP's EliteBook Revolve 810. The touchpad is on a level with the wrist rest, but its matte surface feels a bit sleeker than the surrounding areas. 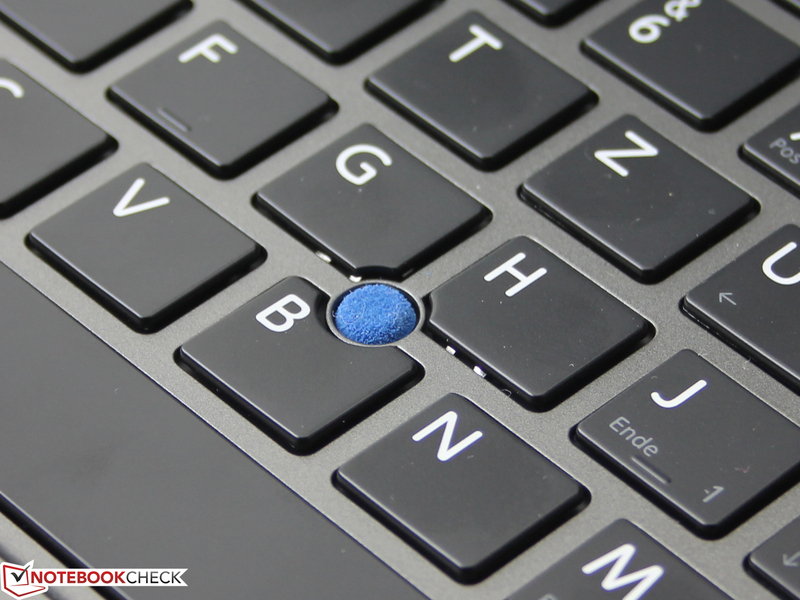 It is not a ClickPad; the keys below it are separated by a slightly different feel. 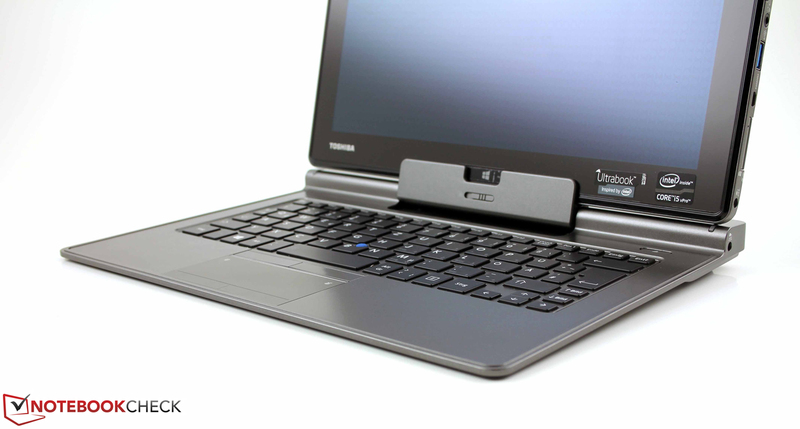 The keys primarily belong to the AccuPoint, as Toshiba dubs the blue pointer in the keyboard. 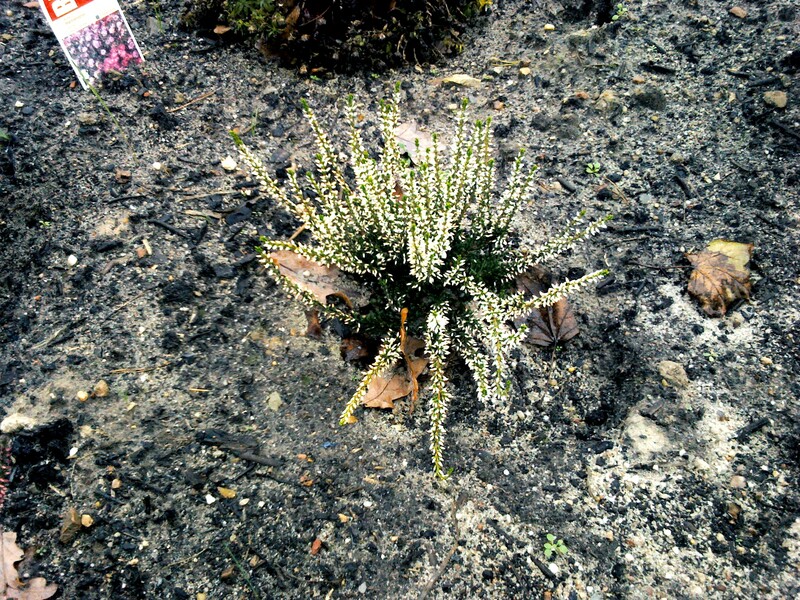 They feature a short yet sufficient drop and very clear feedback. The noise is muffled and quiet. The pointer is set a bit slow by default. All in all, the combination of AccuPoint, pad, and keys create variably adjustable input options that enable fast operation. 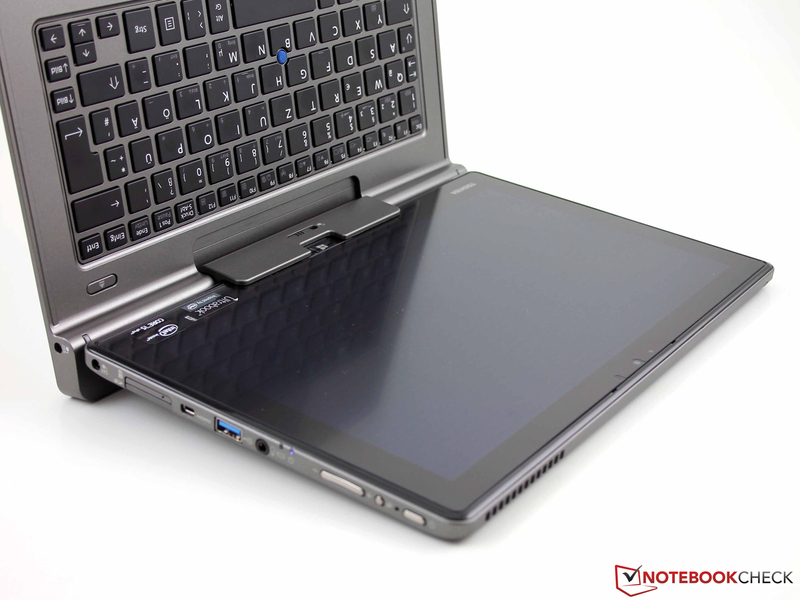 We experienced the biggest drawback of the Portégé Z10t when we opened the tablet in the keyboard dock. It was still just possible to work with the 100 degree opened screen on the lap (difficult for tall people). On the desk, we pushed a 4 cm block under the touchpad to tilt the screen backward. It might be a matter of familiarization, but we simply could not get used to looking at the TFT from above. This is the opposite of what business customers want, no matter whether it is a budget or premium device. Above all, we did not discover a constructive necessity for restricting the dock's opening angle. Why glare-type when matte is possible? The anti-reflective, 11.6-inch screen (model: IPS, Toshiba TOS508fF) is clearly matted by an anti-glare protector, which is visible at the edges. It extends right up to the screen's edges, so even beyond the visible TFT. 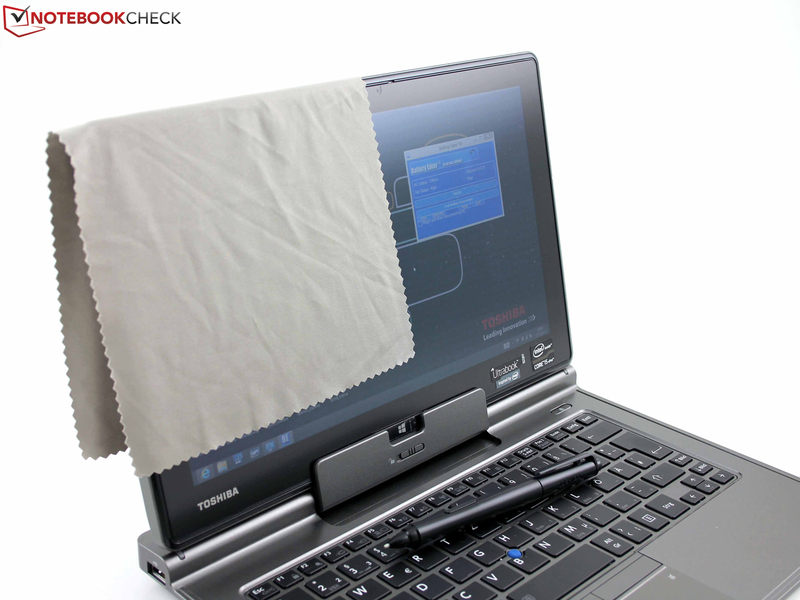 Toshiba calls it an "anti-fingerprint and anti-glare" finish. We cannot yet say how durable this sheet will be. It could probably be pulled off maliciously. The manufacturer specifies the glass underneath it to be IOX glass. The resolution of 1920x1080 pixels corresponds to our expectations in this price range. 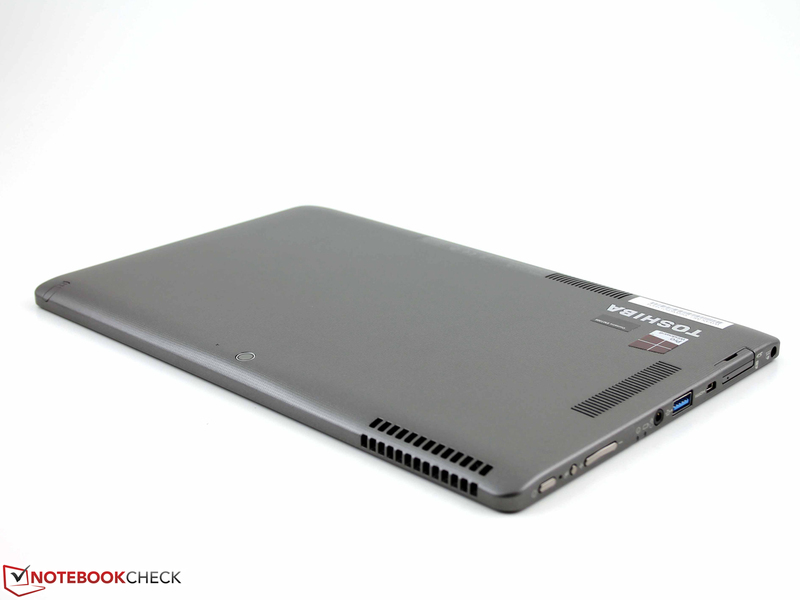 Lenovo's ThinkPad Helix (11.6-inches, FHD) matches that, but not HP's EliteBook Revolve 810 (1366x768, HD). Both contenders have a glare-type multi-touch screen. 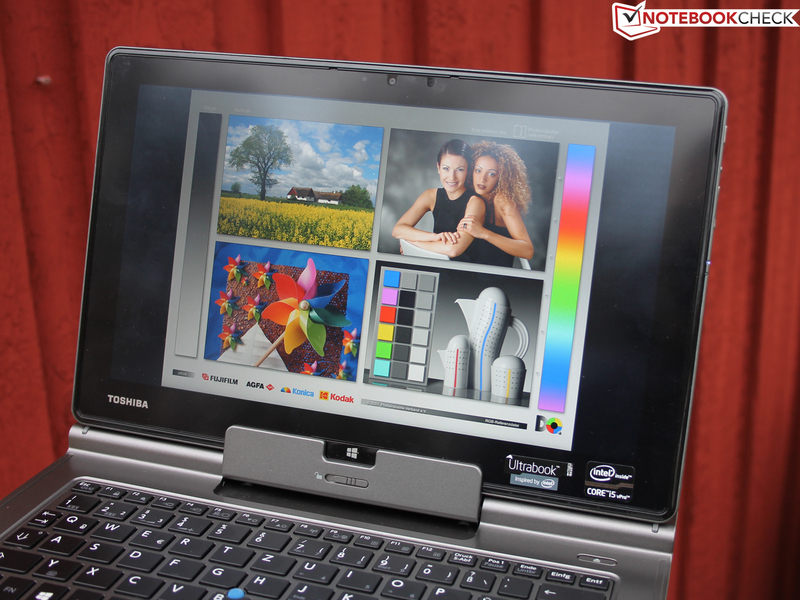 Toshiba's "high-brightness touchscreen" is in fact quite bright. 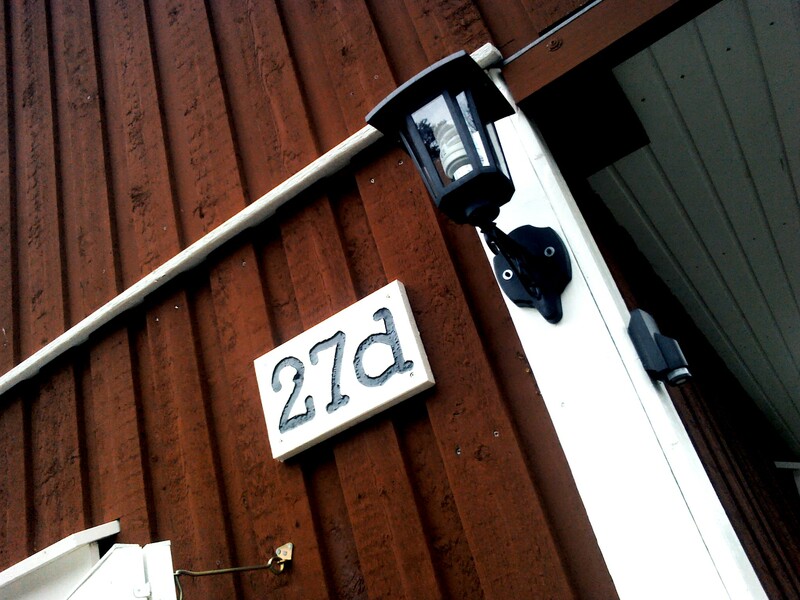 We measured an average of 277 cd/m². 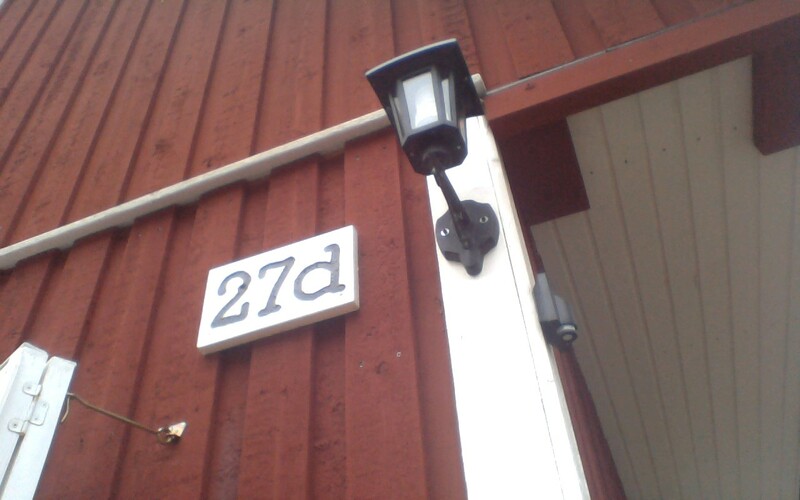 The massive deviations between the measuring zones lead to a poor illumination of 73%. Minor clouding at the edges and a larger one in the upper area are visible on a black background in a dark room (clouding, four areas with maximum brightness). 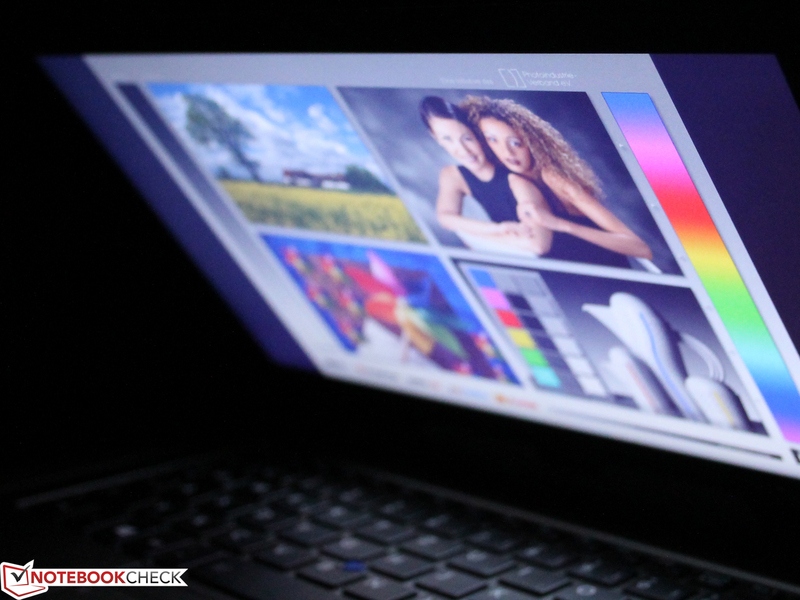 An ambient light sensor is installed beside the front-facing webcam, which automatically adapts the brightness to the ambient light. 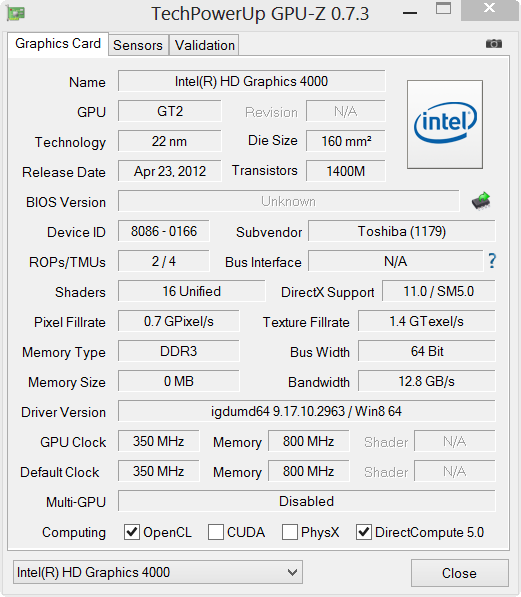 We disabled it for the battery runtime tests by deactivating Intel's HD Graphics energy-saving feature. The IPS screen's contrast is beyond reproach. Neither contender achieves 1158:1 (ThinkPad Helix: 949:1; Revolve 810: 723:1). 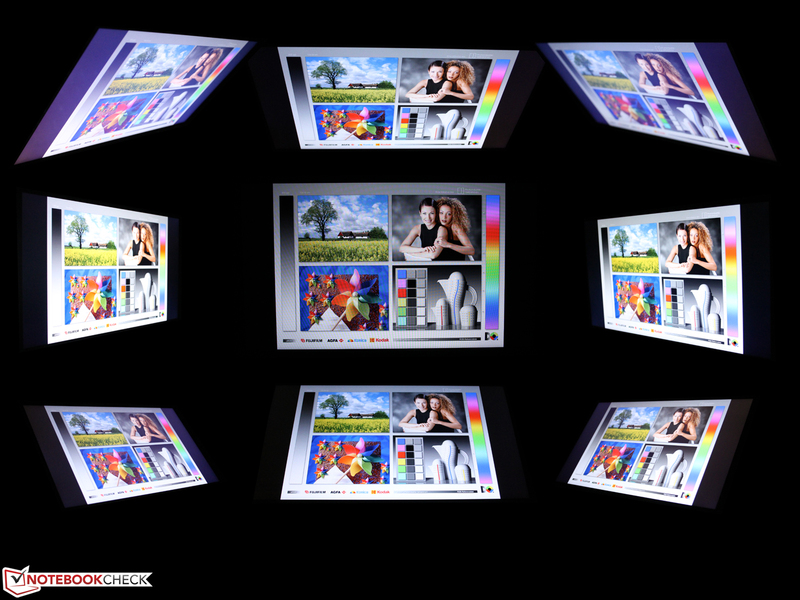 The screen should cover the sRGB reference color space to meet the highest professional demands. Like HP's and Lenovo's device, it very clearly fails this. AdobeRGB is only covered by 44%. We measured the screen in its state of delivery using a spectrophotometer (X-Rite iPro 2). CalMAN recorded a perfect grayscale in sRGB standard; it only uncovered deviations in the colors blue and magenta. However, these shifts are low on average and barely visible (color chart comparison). The ColorChecker specifies a DeltaE 2000 of four. 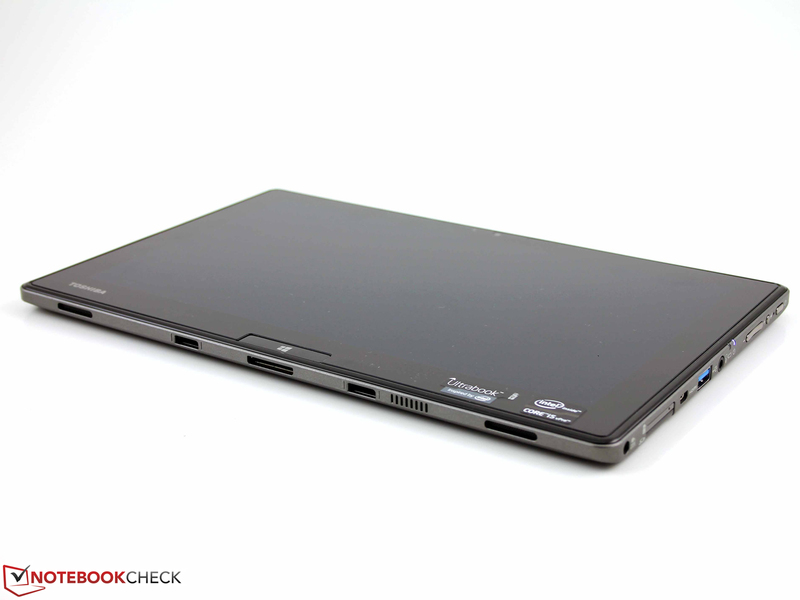 The ThinkPad Helix is even more precise in color accuracy; the Revolve 810 is very similar to the Z10t. In daylight, the Z10t demonstrates its strength: the matte screen. The reflective Revolve 810 and Helix both need support in the way of a higher brightness, but are nevertheless not as well-legible as the Z10t outdoors. The insensitivity to slanted viewing angles is one of the advantages of IPS screens. Content remains legible even when virtually looking at the screen from a right angle. There is no sign of color deviations or excessively decreasing contrasts. The contenders are set up equally strong. 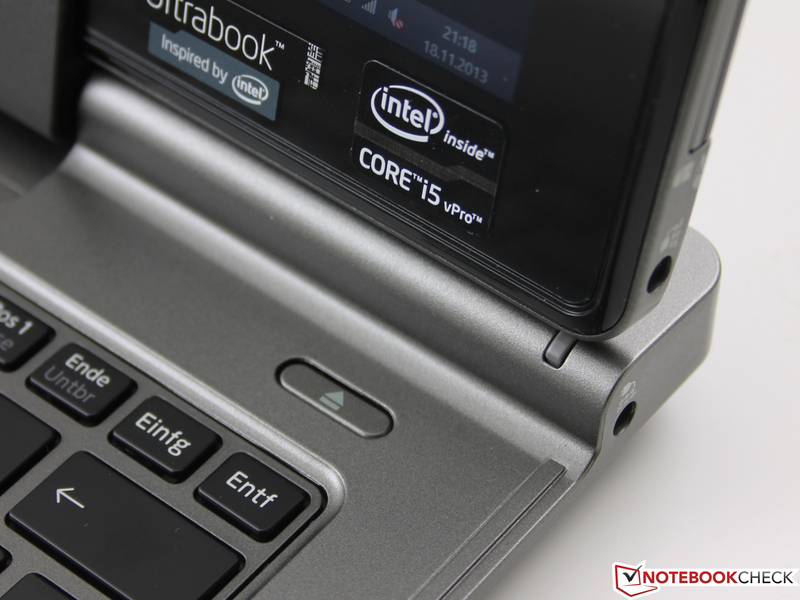 Does the Z10t want to make a subnotebook unnecessary and thus sports laptop hardware? 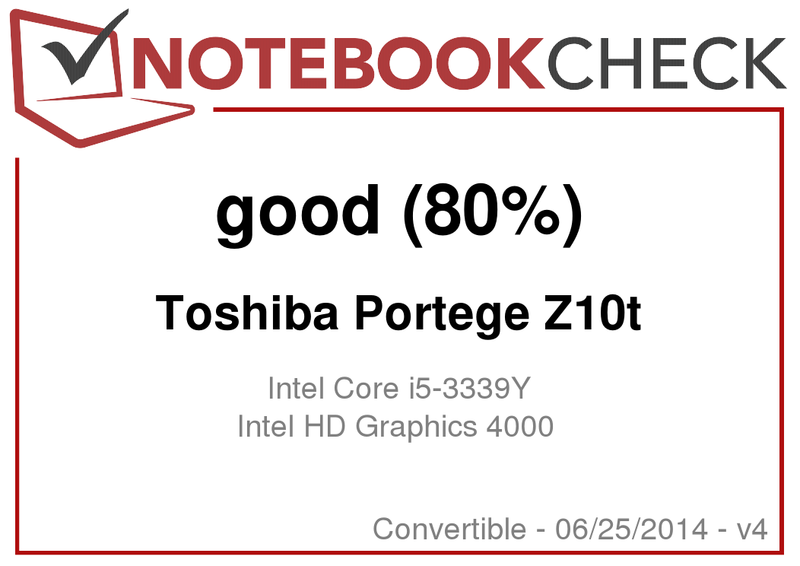 Not quite: Toshiba opted for the exceptionally economic Intel Core i5-3339Y (1.5 GHz) with a TDP of 13 rather than ULV-typical 17 watts from the Ivy Bridge generation. This CPU, alongside the integrated HD Graphics 4000, has until now only been installed in tablets (Toshiba WT310, Lenovo IdeaPad Yoga 11S). The processor features a Turbo to 2.0 GHz. A 256 GB SSD from Toshiba (THNSNF256GMCS) and 4 GB of single-channel RAM complete the total package. 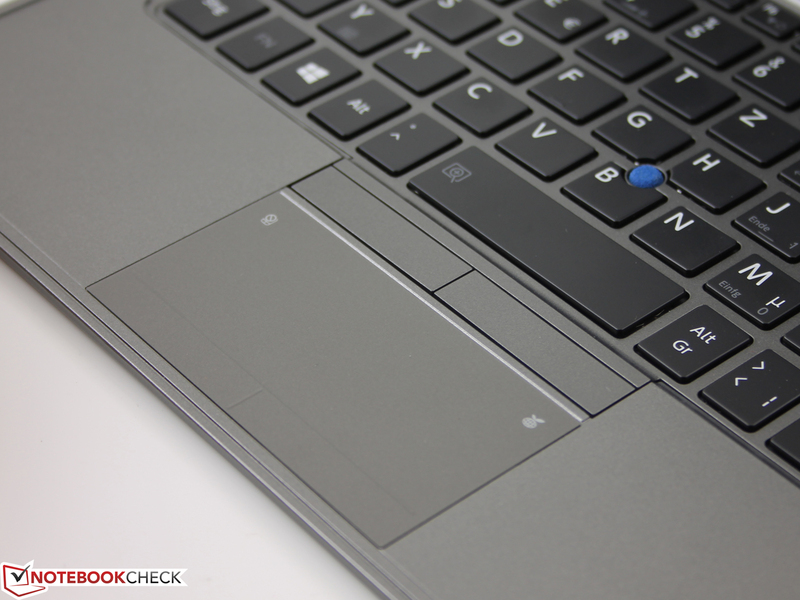 Can the Core i5-3339Y (1.5 GHz) really achieve the performance of a typical ultrabook CPU, such as the Core i5-3437U (1.9 GHz) in the EliteBook Revolve 810? Not quite, as Cinebench R11.5 proves. The Z10t misses the processing speed of the i5-3437U by 27%. However, the multi-score is exceptionally good, which is due to the Turbo of 2.1 GHz. Normally, the maximum Turbo for 2 cores should be 1.8 GHz. 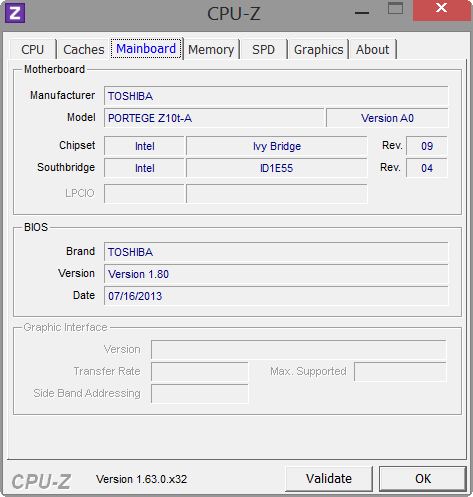 Toshiba states an "increased Intel SpeedStep Technology" in its specs. By the way, the clock remains consistently high in (permanent) single-core load. 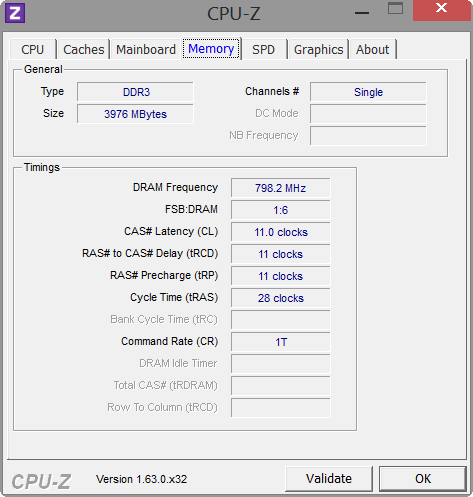 Thus, the Z10t achieves the performance of the marginally higher clocking i5-3337U in Acer's W700 tablet (1.8 to 2.7 GHz). 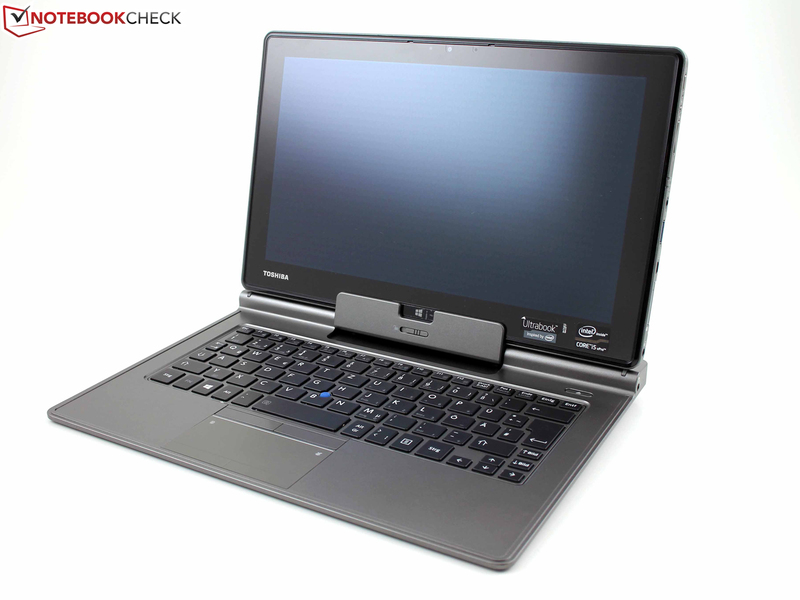 But this is a bit deceiving because the W700 suffers from thermal throttling, unlike the Panasonic Toughbook CF-AX2 with the same clock (1.8 to 2.7 GHz). We did not ascertain throttling during simple load in that case. The performance remained unchanged in battery mode when in the dock (GPU and GPU); all R11.5 scores are completely verified. It looks pretty much the same in single-core load. The contenders with an 18 watt TDP are slightly better (Helix: i5-3317U, 12%). All in all, we are talking about a performance advantage of approximately 20% in similar devices. This should not be a decisive difference for most users. The question whether the Z10t can translate this minor "drawback" in decent battery runtimes is more interesting. Please see the Energy Management section. We only see minor differences between the systems in the application performance, as the CPU performance above suggests. The SSD and even how the memory is connected have a major part in this. Since all tablet or convertible contenders sport a midrange or upper-range SSD (no low-cost MMCs like in Atom tablets, e.g. 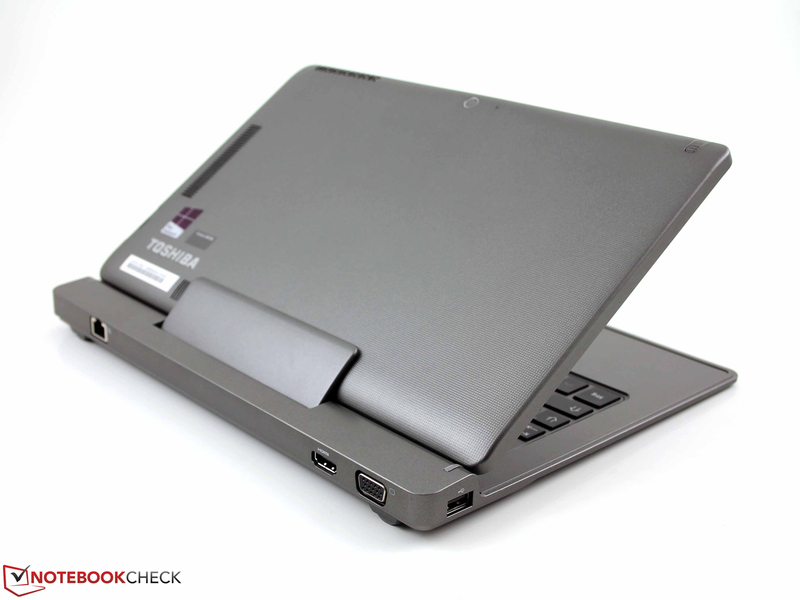 Transformer Book T100TA), both PCMark 7 and PCMark 8 recorded a maximum difference of 21%. 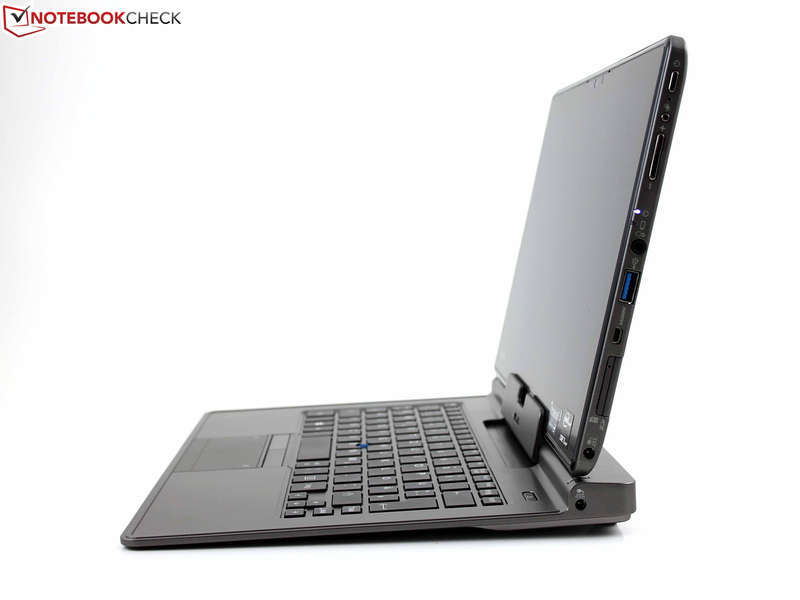 Dell's Latitude XT3 deviates from the norm because it sports a HDD being a conventional turn-and-tilt convertible. 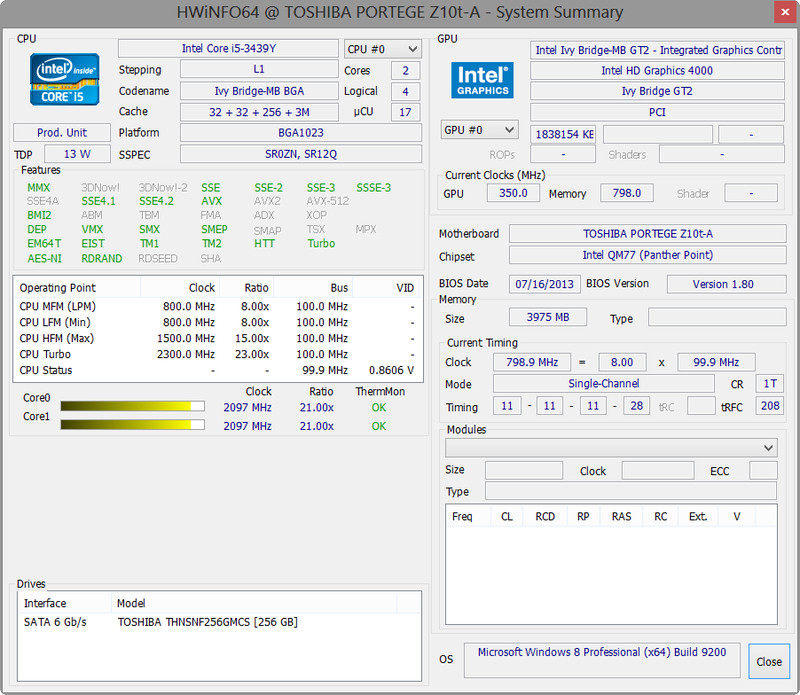 Toshiba's 256 GB THNSNF256GMCS SSD delivers good results, particularly in reading small blocks (4K tests). Samsung's MZ7PC128HBFU SSD (EliteBook Revolve 810) and Intel's 525 Series SSDMCEAC180A3L (ThinkPad Helix) are faster in the 4K test. In contrast to that, the 4K Write Test is a bit weak. 21 MB/s is only half as fast as the other contenders. However, copying and writing large files are performed swiftly. 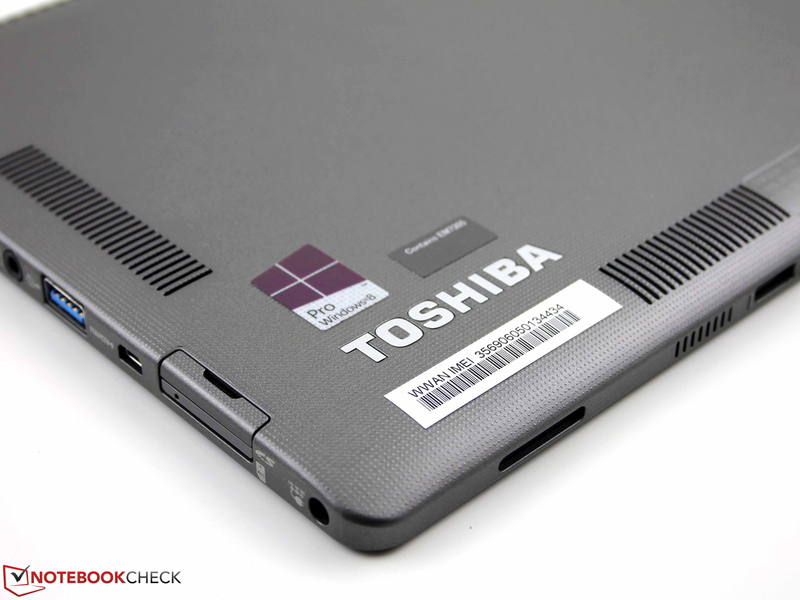 Toshiba's SSD can surpass the contenders by 42 to 77%, particularly in writing (450 MB/s). Dell's Latitude XT3 again lags behind due to its HDD. The Gigabyte S1185 also deviates negatively, which proves that there are differences among SSDs in Performance Detail. The tablet's Intel HD Graphics 4000 has to manage with a single-channel memory, which is a bad omen for performance. A relatively poor score was noticed in the Cinebench R11.5 OpenGL test, which is due to the reduced clock rate of 850 MHz (13 watt TDP by Intel). The contenders' HD 4000 generally runs faster with usually 1100 MHz. 3DMark 11, including all sub-scores, recorded faster rates among the contenders. Microsoft's Surface 2 achieved the best score with the newest Haswell processor (HD 4400). The best conditions for an occasional game after work are not offered. Current titles are usually not playable unless the hardware requirements are low, like in Dota 2 (low details @ 1024x768 pixels). Like in most contenders, an active fan has to blow the warm waste heat away from the processor. It does this with an acceptable noise level of 30 to 32 dB(A) in idle. The fan is never inactive. Both contenders show a similar behavior. The noise increases clearly during load and reaches an average of 37 dB(A) (3DMark06). 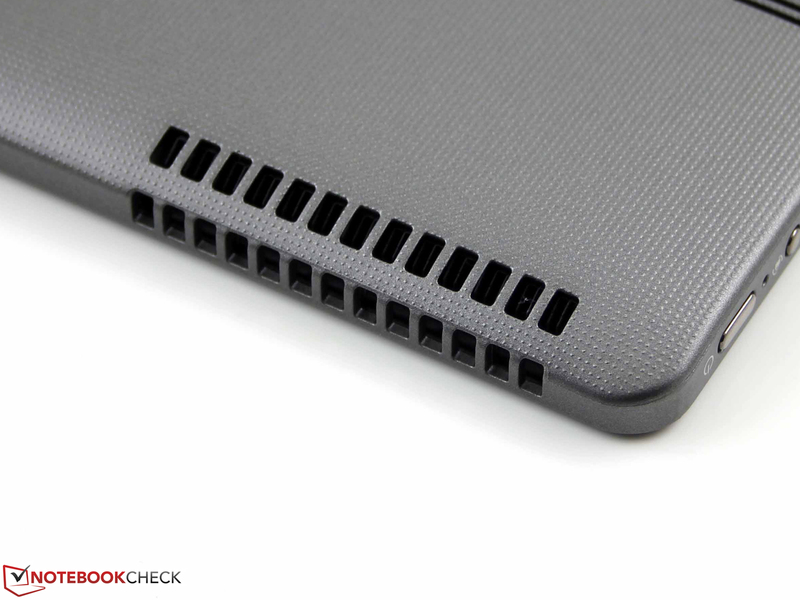 The ThinkPad Helix is still quiet with 30 dB(A) here; the Revolve 810 is on par with that. The Helix remains very quiet with 33 dB(A) in maximum load (Z10t: 40 dB(A)). However, Lenovo accepts high casing temperatures (+38%) to achieve this. A Windows tablet does not always need a fan. Apart from Intel's Atom tablets (Bay Trail), some manufacturers are taking a stab at fan-less convertibles. Examples would be HP's Spectre 13-h205eg x 2 (HD Graphics 4200, Core i5-4202Y) and the Satellite W30Dt-A-100 (AMD A4-1200). Does the loud fan at least keep the casing cool? Yes: we measured a maximum of 40 °C on the back during the stress test. The Revolve 810 reaches 46 °C in this state, and the ThinkPad Helix cannot even be touched with 67 °C. The casing is pleasantly cool in idle; the average is 30 °C on both the top and bottom. We perform the stress test to check the temperature and system behavior during full load. 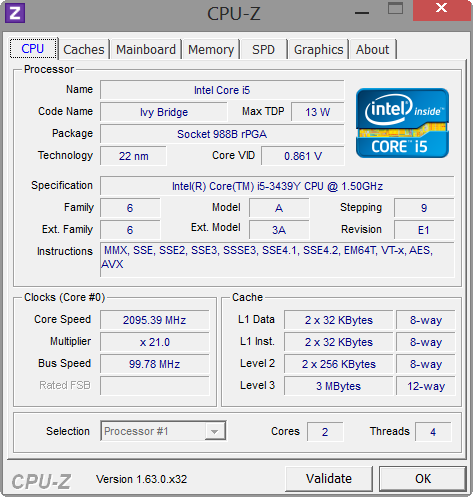 The CPU's clock rate nosedives to 1.0 GHz after a short time. The GPU appears to be prioritized in the TDP budget during this kind of simultaneous load because it keeps its 850 MHz consistent (maximum). The CPU processes the related benchmarks above with an increased Turbo (2.1 GHz), and so users will not have to fear performance reductions to 1.0 GHz in normal load operation. We performed 3DMark06 directly after the stress test to ascertain any side effects of the thermal load. There are none; the score was even slightly higher. (±) The palmrests and touchpad can get very hot to the touch with a maximum of 39.7 °C / 103.5 F.
(-) The average temperature of the palmrest area of similar devices was 29 °C / 84.2 F (-10.7 °C / -19.3 F). The speakers are on the tablet's lower edge. The sound completely lacks bass and dynamic, the maximum volume is not particularly high. Also, distortions occur in maximum volume, even in speech. Like most tiny speakers, the mids are overemphasized. There is no surround feeling. Most Windows tablets are very frugal in power consumption. The average idle minimum ranges from five to six watts (Microsoft Surface Pro 2: 3.1 watts). 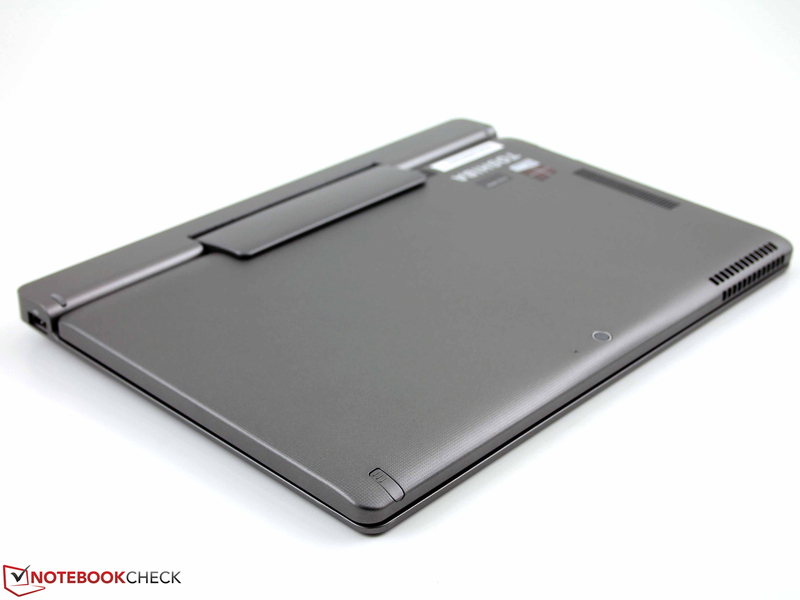 In contrast, Lenovo's ThinkPad Helix (7.9 watts) and HP's EliteBook Revolve 810 (7.1 watts) are genuine energy wasters. The Z10t wins the championship in terms of low power consumption with a load average of 21 watts, and load maximum of 24.5 watts. 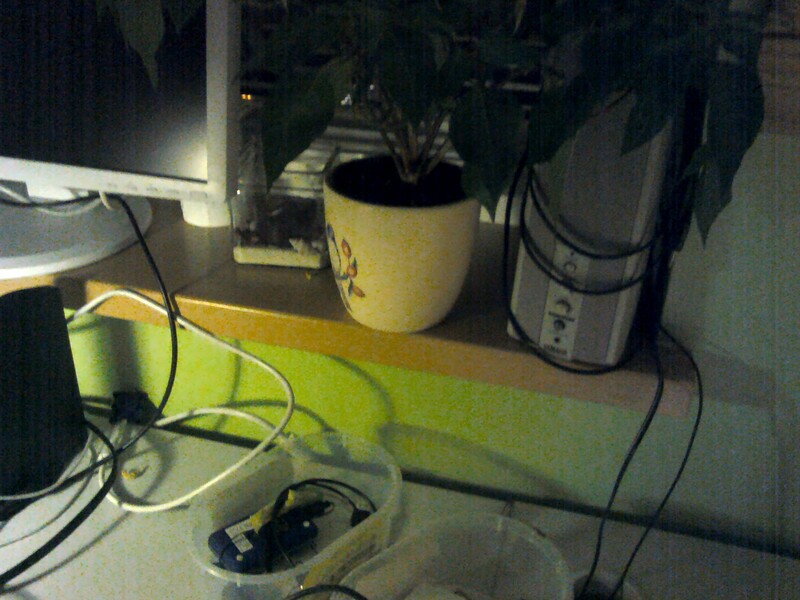 Both the HP (+69 / + 68%) and Lenovo (+40 / 41%) drain considerably more from the socket. We did not find the additional battery in the docking station (called "KeyboardDock" in the shop). We generally performed the battery tests while the tablet was in the dock. A random test using solely the Classic test (load) on the tablet finished with virtually identical 1:56 hours; there is definitely no battery under the keyboard. The manufacturer also only specifies one lithium-ion (prismatic), 6-cell battery. The runtime is impressive when the capacity of 38 Wh is put in relation. The Z10t lasts up to 60% longer (Gigabyte S1185) than its contenders in idle. HP's EliteBook Revolve 810 and Lenovo's ThinkPad Helix are also defeated (44 and 31%). In the more significant Wi-Fi test, where a script opens websites every 40 seconds using a brightness of 150 cd/m², Lenovo's ThinkPad Helix takes the lead due to its higher capacity of 70 Wh (47%). The Revolve 810 is on par (44 Wh). Toshiba's Portégé Z10t proves to be a versatile and interesting professional tablet that convinces in many aspects and disappoints only in a few things. Although the computing power of the 13 watt processor lags behind the contenders slightly, the application benchmarks recorded negligible differences to the tablet and convertible contenders. 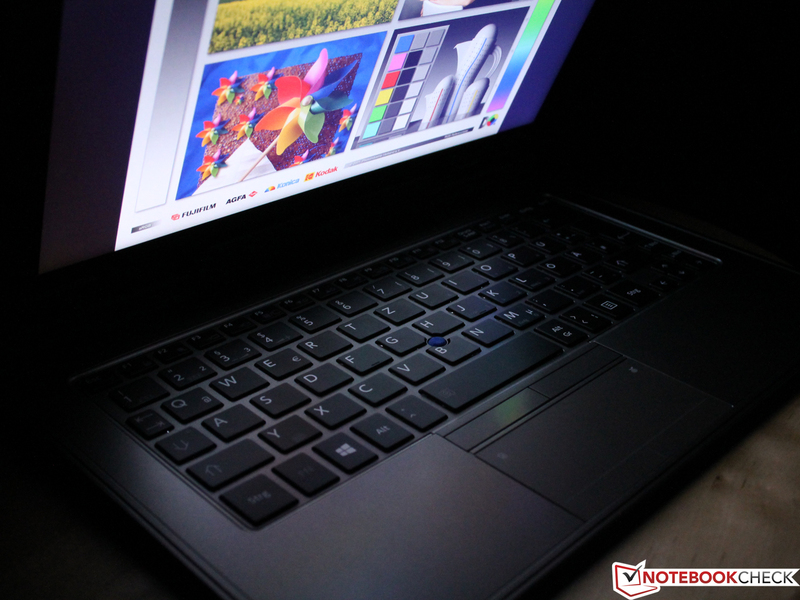 In our opinon, the i5-3339Y seems to be a very good compromise between ultrabook performance and runtimes. In relation to the fairly low capacity of 38 Wh, the Z10t has the best runtimes in the category comparison. However, HP's EliteBook Revolve 810 (44 Wh) and Lenovo's ThinkPad Helix (70 Wh) simply have a higher capacity, which evens out their higher power consumption, and like in the case of the ThinkPad Helix, leads to a twice as long runtime. It is ultimately up to the buyer whether five hours of runtime (Wi-Fi test) will be enough. But why did we choose "Clipped wings" as the introduction? 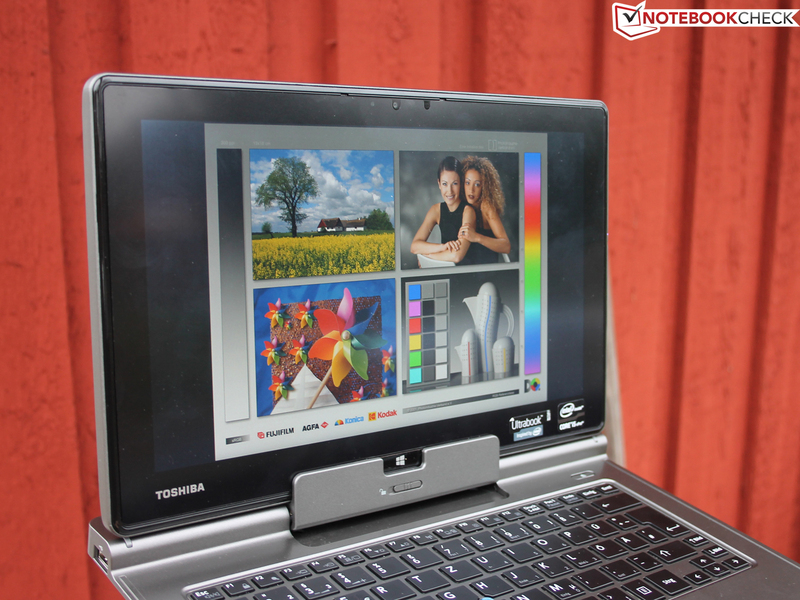 Well, Toshiba's Portégé Z10t-A-10M is almost the ideal Windows convertible for professional use. 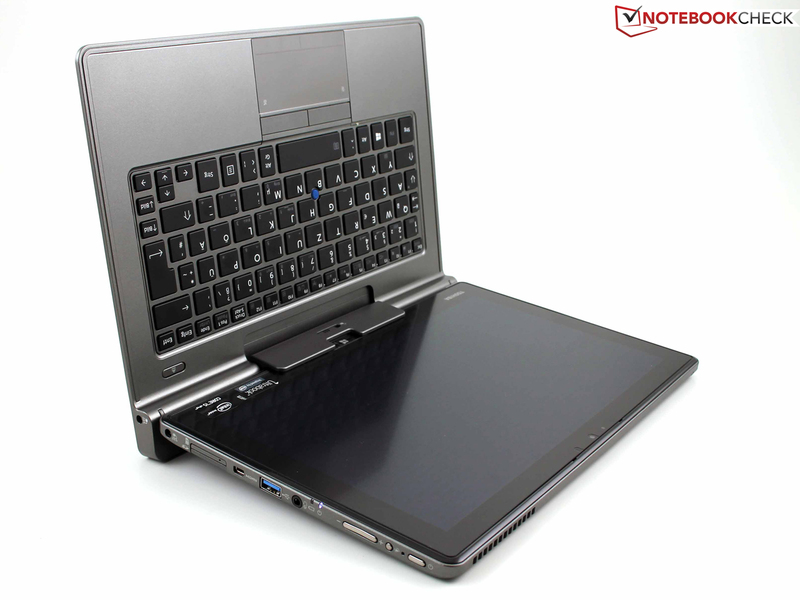 It features VGA, Ethernet and USB for both mobile and stationary use, and the general application performance can compete with most subnotebooks. 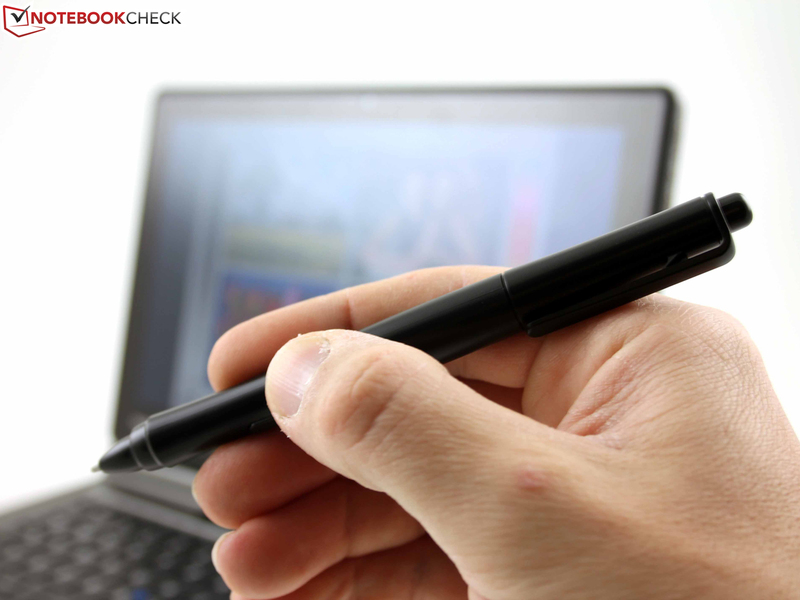 The input devices of the docking solution (keyboard, touchpad, pointer) complement the touchscreen and both digitizer pens. The fingers barely leave prints on the matte FHD screen, and mobile connectivity is ensured via the LTE broadband modem. Up to here, only positive things, so where is the catch? The keyboard dock only allows an opening angle of approximately 100 degrees. We could not work properly with that, despite the good IPS viewing angles. A minimum of 130 degrees is common in laptops. Buyers should opt for Toshiba's Portégé when the opening angle issue is irrelevant, but a matte, IPS, Full HD screen is at the very top of the wish list. Barely another contender in the business category has the latter. Devices with a non-glare screen are Toshiba's WT310 (FHD, IPS, 1050 Euros, ~$1437), Panasonic's Toughpad FZ-G1 LTE (FHD, IPS, 2000 Euros, ~$2738, review coming soon), Toughbook CF-AX2 (HD, 2300 Euros, ~$3149) or HP's Spectre x2 13-h205eg (FHD, IPS, incl. KeyboardDock, 1100 Euros, ~$1506). HP's Split x2 13-m115sg (HD, TN, 900 Euros, ~$1232) is also matte, but is a consumer device. HP's EliteBook Revolve 810 (glare TFT) comes into question when an HD resolution suffices, and the build as well as the input devices have to be perfect. Lenovo's ThinkPad Helix (glare TFT) is an alternative when battery runtimes are extremely important. The keyboard dock's input devices are of the high standard of the T-Series ThinkPads, and therefore absolutely recommendable. Toshiba Portégé Z10t-A-10M: Focus on the keyboard dock. A well-rounded office bundle, if it weren't for the screen's too small opening angle. ...with a claim for perfection (at least in one specific area, e.g. weight). ...but also Windows tablets belong in the Portégé lineup. The Portégé Z10t-A-10M is even a convertible. ...and of course a keyboard with touchpad and pointer. The docking station is exceptionally rigid and of high-quality build. The base plate is made of metal. Thus, the dock weighs 579 grams. The whole convertible adds up to a "heavy" 1435 grams. That is quite a lot for a tablet and keyboard. Very aggravating: The dock only allows opening the screen to 100 degrees. That is too little for pleasant use and causes problems for the user. ...why Toshiba's engineers did not implement a 130 degree opening. 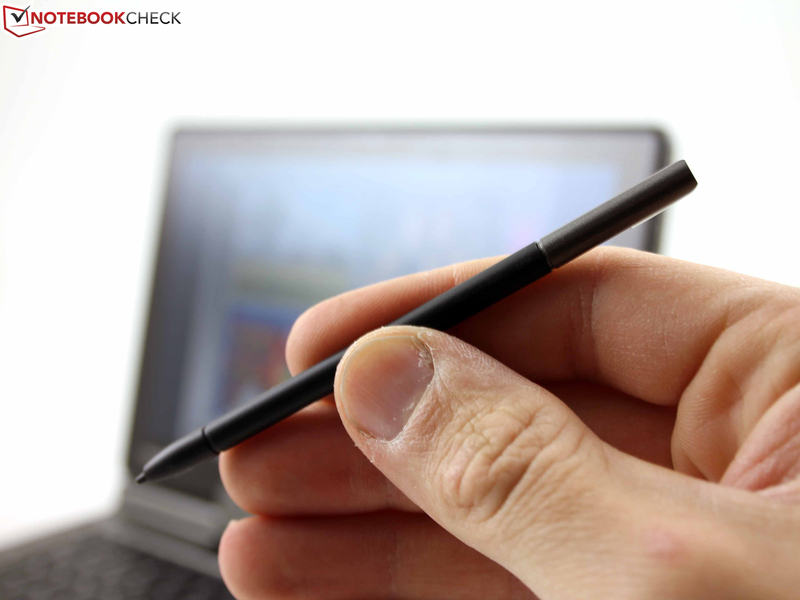 A small digitizer pen is inserted into the tablet. 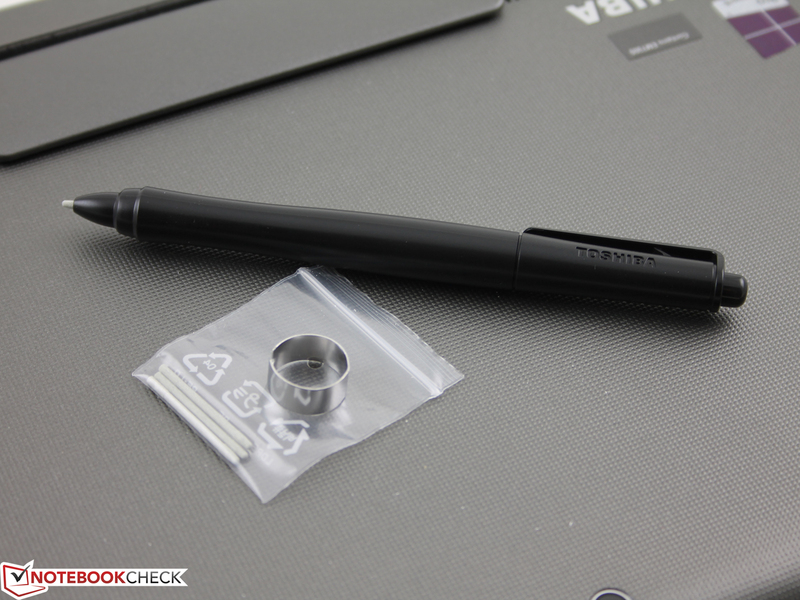 There is also a pressure-sensitive pen for sketching. 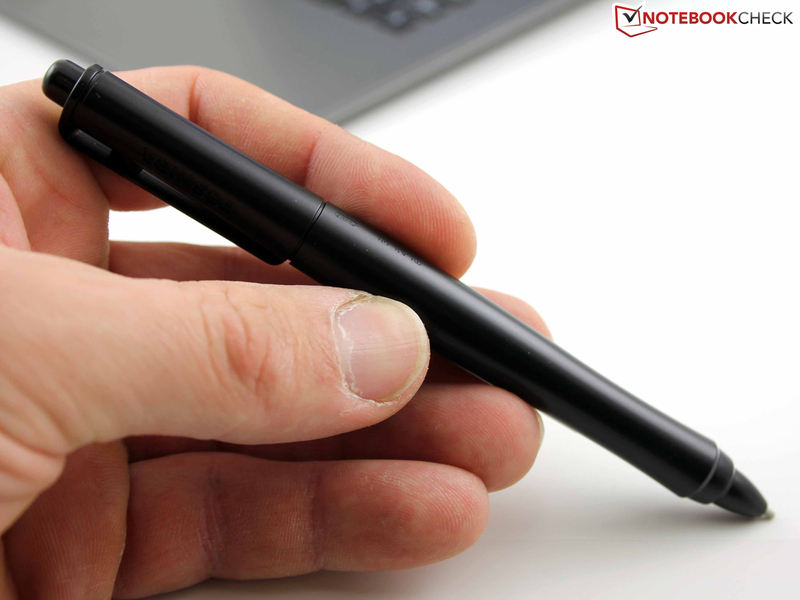 The user always has the small pen at hand; the bigger one is more suitable for sketching or handwriting. The keyboard features a one-stage light. It is turned on or off permanently via the FN key. This button prepares the system for undocking. The viewing angles of the matte, IPS TFT are very good. Both speakers are on the lower edge. Insert the SIM card and it's ready for UMTS/HSPA+/LTE on the go. The cloth will rarely be needed. 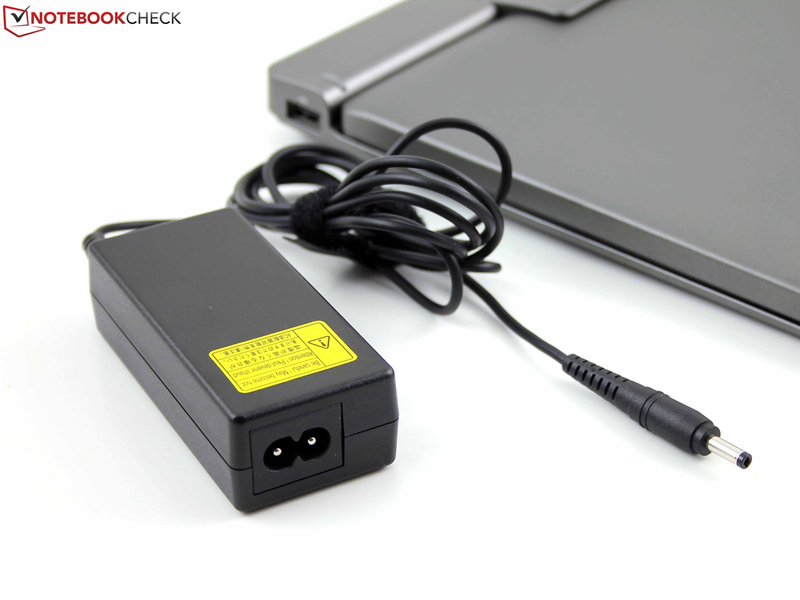 The 45 watt power supply can be connected to either the tablet or the dock. The tablet's build is not as good as that of the dock. The construction warps quite strongly. 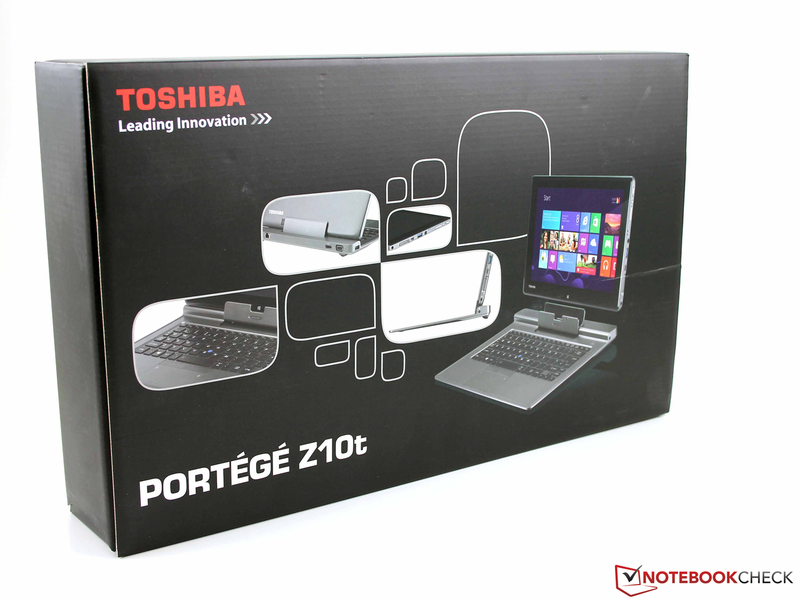 Toshiba Portégé Z10t-A-10M: The small opening angle extremely affects the overall idea. 130 degrees should have been the minimum. 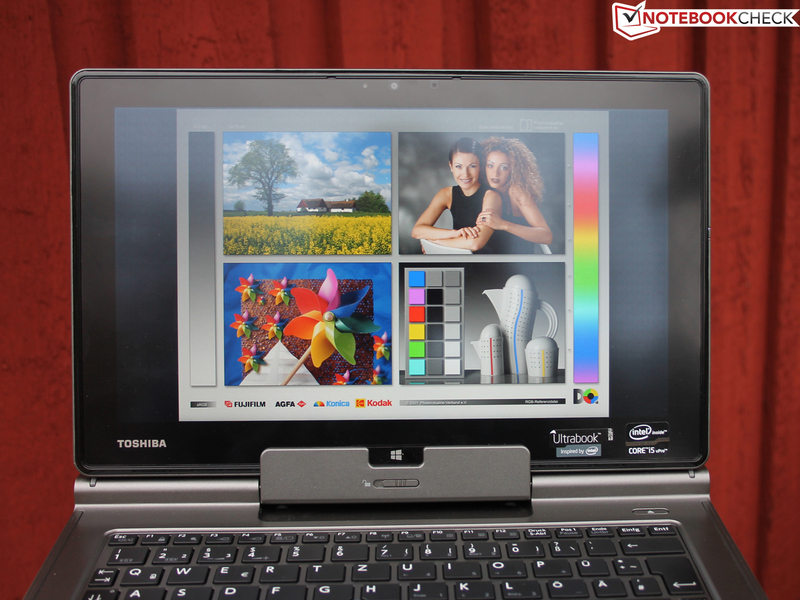 Toshiba Portégé Z10t-A-10M: Writing and sketching accurately with the pro-digitizer (no batteries). Toshiba Portégé Z10t-A-10M: Good though not perfect keyboard. Toshiba Portégé Z10t-A-10M: The keyboard features a backlight. 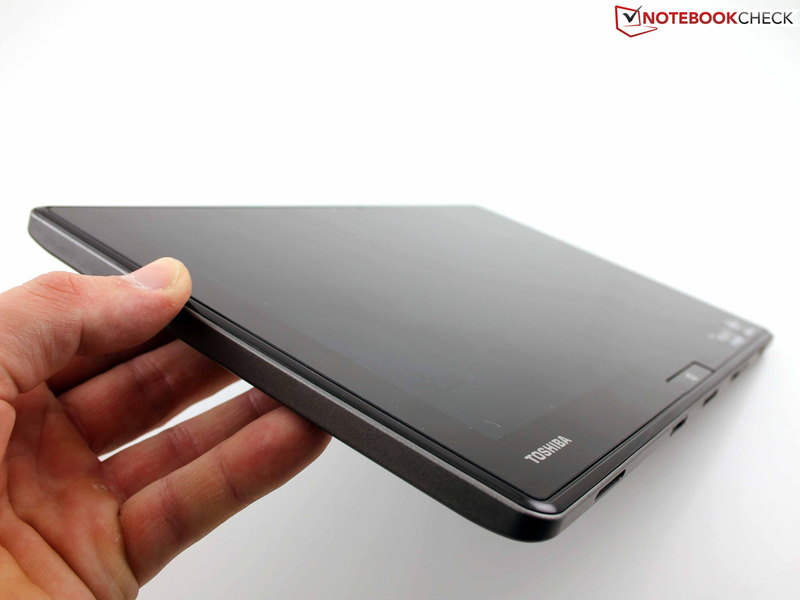 Toshiba Portégé Z10t-A-10M: The IPS screen's wide viewing angles and high contrast. The many ports on the dock's rear. Matte IPS screen, perfect for outdoors. 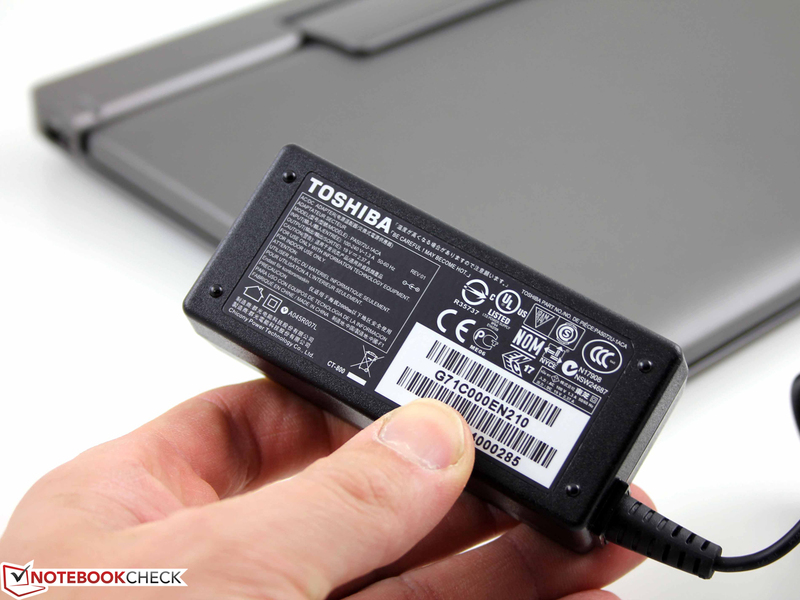 Toshiba increases the CPU's Turbo range and allows the 13 watt core to supply very good results. Security features and communication modules (LTE, dual-band Wi-Fi) like traditional business devices. The dock could have used a USB 3.0 port. The keyboard's drop is too short for the professional claim, but that is a matter of taste. 100 degree opening angle? Tall people will not want to work at the desk that way.